Hello everyone! This is my first post on Talkhaus, but I wanted to introduce some hacks I've been working on fixing so they can not only be console compatible but to also fix some glitches that are associated with the games themselves. I also wanted to share these in a place other than the Japanese Hacks Discussion thread of SMWCentral. Here are some of the hacks I've fixed. 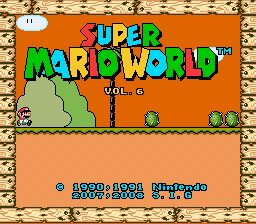 These can not only be played on ZSNES, but on accurate emulators and consoles as well. The Readme details just about everything that I've done with these hacks. Disclaimer: I don't own any of these works, I've just fixed various bugs with them and allowed console compatibility by fixing the music. All of these hacks were tested on BSNES. 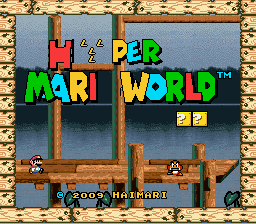 Note: This hack is a remake of Super SIG World 1. Special thanks to cybershell12 for translating the thirteenth game! UPDATE 9/18/2018: Fixed the flashing light level in the lava world and added echo sfx to underground levels. 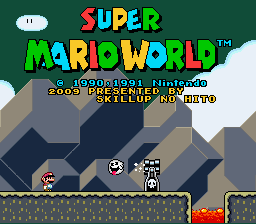 Skill Up Mario by "Skill Up No Hito"
Also, if anybody has any bugs they'd like to report feel free to let me know so I can fix them. Next projects I really want to work on are Hyper 4 and 5. The only problem is getting some of the resources (which seem impossible to find anymore) or finding a way to get AddMusicK getting to work with these hacks. So if anybody else can help me out with these things as well, feel free to let me know (you'll get credit of course as well for the help)! Thanks for reading and enjoy playing these hacks! Last edited by simfan96 on 10 Mar 2019, 21:28, edited 16 times in total. Hey, welcome to the Talkhaus! Nice to see that there are some other people out there that are working on fixing these old Japanese hacks. Great work with these! Just so you're aware, there's already a fixed version of VIP 4 available! If you check this thread, there's a link to it in the OP. We're currently still tweaking some things regarding certain translations, so please be aware that the patch in that thread is not the finalized one, but we should be able to post a fully translated and fixed version sometime in the next couple of weeks. We're already working on fixing the other VIP hacks as well! The plan is to go over each one, look at some translation quirks and fix the music and slowdown issues while we're at it. Since it doesn't really make sense for there to be multiple fixed versions of the VIPs out there, it might make some amount of sense to hang on with those? Maybe some time in the future we'll take a look at a possible English translation of the Hyper series as well, although that is sort of up in the air since we want to focus on the VIPs first and foremost. If it does happen, we'll make sure to hit you up though. Hello Ryrir! Thank you for your reply! I'm absolutely amazed that someone fixed VIP 4 already, I didn't hear about it until now! I'm watching Raocow's playthrough right now of it, and it looks incredible, especially the integration of the translation notes and everything! Wonderful job fixing that hack! Now you give me a great reason to replay VIP 4, looking forward to seeing the finalized version, it's already looking great Definitely will hold on with working on creating a fixed VIP 3 as you all have done an incredible job fixing the 4th game and am looking forward to seeing what you all have in store for the other VIPs as well! I greatly appreciate your work. Anyone working on console fixing hack is my hero. aterraformer wrote: I greatly appreciate your work. Anyone working on console fixing hack is my hero. Thank you so much aterraformer, that really means a lot to me! I'm also planning to fix some more hacks in the future as well once I find all the proper resources and everything, stay tuned! Thank you so much! I'm loving the SIG series so far and that's a great idea! 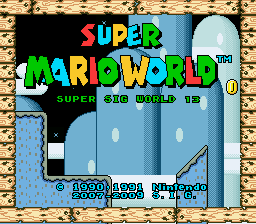 I've currently played a majority of the early SIG Worlds (with the exception of 2, but 16 is essentially a remake of 2) and am currently on SIG World 18, once I get to 21 and on and get a feel for the resources used in the hacks I'll absolutely look into fixing those as well! Thank you so much for the suggestions, I'll definitely look into it! Hey, so I got to 9-2 in SIG10 but it seems I'm stuck. I collected all the coins but could not get past the barrier. I watched Lordkronos' video and it looked like after he did exactly as I did, he seemed to have cheat clipped though the barrier. Do you have any idea how to pass it? aterraformer wrote: Hey, so I got to 9-2 in SIG10 but it seems I'm stuck. I collected all the coins but could not get past the barrier. I watched Lordkronos' video and it looked like after he did exactly as I did, he seemed to have cheat clipped though the barrier. Do you have any idea how to pass it? I was very stuck on this too. At first I thought it was broken but there's actually a trick I did find out thanks to the help of Morsel. Once you collect 29 coins from every other thing you do in the level, keep the springboard and make sure you have Yoshi. Have Yoshi put the springboard in his mouth and keep the springboard in Yoshi's mouth until he completely swallows it, this will gain an extra coin marking Mario as having 30 coins making it passable. I hope that could help out! There's another level kind of like this as well, if you also get stuck on this feel free to let me know and I'd be more than happy to help you out! Thanks for playing my fixed hack too! I'm sorry, but how exactly is SIG13 different from SIG1? 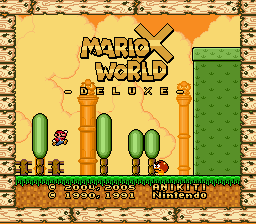 There are only just a few differences to be honest, some fixed bugs, custom music, custom blocks, I think they added only a couple of levels and edited the overworld (I could be wrong though)? Other than that, unfortunately it's just a recreation of SIG 1 just "enhanced". So basically if you did play the first one, you could pretty much skip the 13 one and some of the other remakes. Unfortunately there's quite a bit of SIGs that are like this such as 18 (SIG 3), 26 (SIG 6), 27 (SIG 7), 28 (SIG 8), 32 (SIG 9 (7 and 9 actually appear not to break btw)), 35 (SIG 12) and 36 (SIG 15) are remakes, I'm sure they also made a remake of the 11th game too (has no custom music). 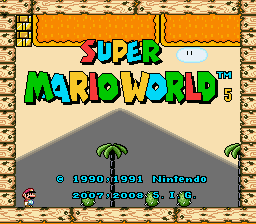 I mainly wanted to recreate this game for anybody who wanted to play a more "updated" version of this game, or even play this over the first game. So does that mean the garbage post game is still there? Ugh, like I want a full on list of SIG but that's really crappy that there's so many rereleases and I can't even play SIG2. There are so many sections with bad design that could have been changed!! Super SIG World 6 (Super SIG World 26 is remake) - testing near finished on fixed version of 6! Last edited by simfan96 on 08 Dec 2018, 20:02, edited 2 times in total. I believe 29 or 30 still broke when I looked. I was able to beat 33 but I didn't get all the exits. He could STILL be using Carol addmusic for all we know. 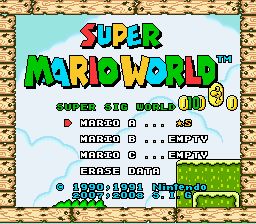 Adding on to that list you posted, Super Sig World 10, 20 & 30 are compilations of the 9 previous hacks each, sort of a "Best Of" if you will - they got 9 worlds where each world uses levels from one of the previous games (world 1 of Sig World 10 would use only levels from Sig World 1, world 2 would use levels from Sig World 2 etc.). So basically, I recommend them to people who just wanna experience the more standout levels from this creator, although the difficulty curve and worldmap exploration isn't as interesting in those games because they are just compilations of stages. Thank you! I did notice that the 20th and 30th game during watching hack playthroughs were definitely lots longer compared to the other games so that definitely explains it! I'm starting to think that SIG did use the older addmusics all until 36. I have yet to test 35 but I did notice that the grinders sound like pre-amk sfx in a hack playthrough video, of course I don't know if that means that it's broken but I can take a good guess and say it's broken, still have to test though. Despite from a single GFX glitch plaguing SIG 6 (it's driving me nuts! I can't get a donut block sprite to display the correct sprite in the Bowser's Castle level!) I have completed it's fixed version which I shall upload very soon. Should I wait to see how I can fix it or upload it with the small graphical glitch? 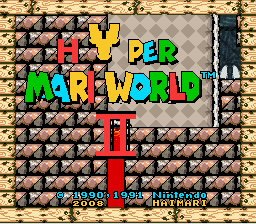 I have also fixed some of the glitches that plagued Hyper III (the dark lava cave level with flashing lights, it'll just stay a bit dark instead) so feel free to redownload that as well if you'd like! 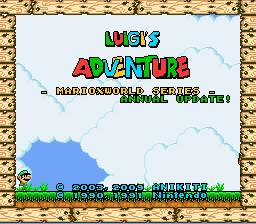 When did you do Luigi's Adventure!? I was just thinking about getting back into it. It's a nightmare by world 3! aterraformer wrote: ↑ When did you do Luigi's Adventure!? I was just thinking about getting back into it. It's a nightmare by world 3! I actually thought about doing it a bit in December and actually finished it early January, what a coincidence too! Oh it's by far one of the (if not the) hardest hack I've played, even the OSE is brutal! Just wait for the World 9 levels.. absolute.. nightmares.. 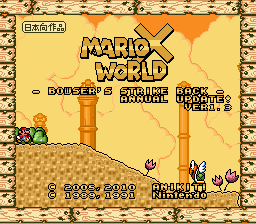 The fixed version of Mario X World - Bowser's Strike Back by Anikiti has just been finished and released! 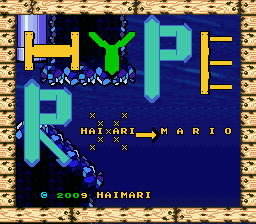 Hyper IV by Haimari has just been fixed and is ready for download! Looking through the readme, I didn't see the final level's midpoint fix. Were you able to do that? I'm not sure if it was the only one. Ah! Forgot to put that in the readme, but yes I did fix that up so that would work properly! I'll get that updated to include that, thank you for reminding me about that issue I think that was probably the only midpoint that had that issue. I hope that could help! 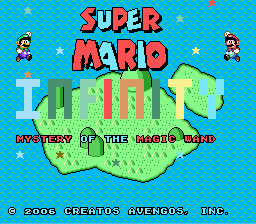 A fixed version of Super Mario Infinity - Mystery of the Magic Wand by Reading has just been released as of today! Update: Included an optional patch where you can play as Mario and Luigi using 1 controller instead of having to have 2 to play.